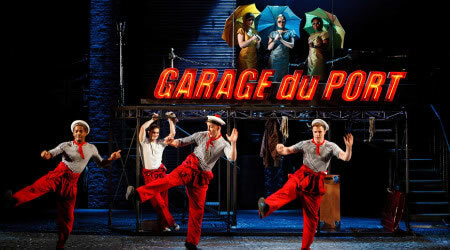 Guide to the London stage musical "the Umbrellas of Cherbourg"
This page is a brief guide to the stage musical Umbrellas Of Cherbourg, which opened in London's West End in March 2011. It is being staged at the Gielgud Theatre. 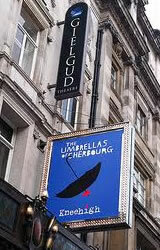 The Gielgud Theatre is located at 39-45 Shaftesbury Avenue, London W1D 6AR (nearest Tube: Piccadilly Circus). It is located at the junction of Rupert Street and Shaftesbury Avenue (the A401). The show lasts for about 2 hours 10 minutes, including a 20 minute interval. Click here to see the seating plan for this theatre. The story is set in Cherbourg, a port town in northern France during the late 50s. It is a bitter-sweet story about young love. 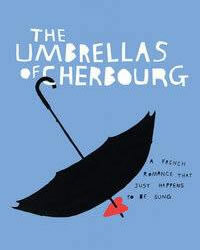 Geneviève is a teenager living with her mother, with whom she works in a shop that sells umbrellas. She falls in love with Guy (a car mechanic), who is only a little older than she is. Her mother opposes the romance, as she sees Geneviève as too young and Guy as too poor. Guy is drafted to the Algerian war for two years, but leaves Geneviève pregnant after a night of passion. Geneviève's mother's shop is having financial problems. A diamond dealer who is in love with Geneviève agrees to pay her debts. He wants to marry Geneviève even after learning that she is already pregnant by another man - eventually Geneviève agrees. Guy returns from the war, limping from an injury to one of his legs. He goes to Geneviève's shop, but this has closed and both mother and daughter have left Cherbourg. Guy becomes bitter and tries to drown his sorrows in the local bars. He is fired from his job at the garage. Soon after he learns that his aunt has died, and after that he marries his aunt's carer Madeleine. With his aunt's legacy, he is able to buy a petrol station. He and Madeleine have a boy. On Christmas Eve Geneviève, now married and with a daughter, arrives with her car at Guy's petrol station. Surprised to see each other, they decide to go inside the station to talk, but they both soon realise that their relationship belongs to the past. She goes away, and soon Madeleine and their boy arrive, and they celebrate Christmas by throwing snowballs at each other. The original film score by Michel Legrand is used in the musical, but the sung lines are in English. The main theme repeated during the show is called I Will Wait for You ("Je t'attendrai"). The musical also includes a performance of Sans Toi (music by Michel Legrand and lyrics by Agnès Varda). This is from the 1962 film "Cléo5à7" ("Cleo from 5 to 7"). 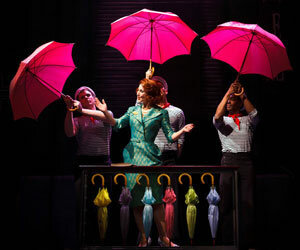 This musical was based on the French film Les Parapluies de Cherbourg (Umbrellas of Cherbourg), directed by Jacques Demy. It was released in 1964. In the film version of this story, Geneviève was played by a young Catherine Deneuve. Born in 1943, Catherine Deneuve became one of France's most successful actresses. She has played leading roles in many films, including Belle de Jour  and Indochine . Les Parapluies de Cherbourg (Umbrellas of Cherbourg) is the middle of 3 films directed by Jacques Demy which share some of the same actors, characters and style. The other two films were Lola (1961) and Les Demoiselles De Rochefort (The Young Girls of Rochefort) (1967). The music was written by Michel Legrand. He is perhaps best-known internationally for his song The Windmills of your Mind (Les Moulins de mon Coeur) which featured in the 1968 film "The Thomas Crown Affair", starring the American actor Steve McQueen. This musical has been produced by Kneehigh Theatre, an innovative theatre group based in Cornwall. This group's previous London shows included a stage version of the classic British film Brief Encounter. The Algerian War was a conflict between France and Algerian independence movements from 1954 to 1962. Algeria (in northern Africa) had been colonised by France since the 1830s. Cherbourg is a coastal town in the Normandy region of northern France. Since 2000 it has been called Cherbourg-Octeville. Ferries from here go to Portsmouth or Poole in England, or to Rosslare in Ireland. English: French accents are used before each of the three scenes, but English accents are used during the story itself. French words and phrases which are introduced are translated. The story is easy to follow. Music: As in the film on which it is based, the story is told entirely using sung lines (rather than separate songs). There is a live piano and band.